The smile that stretched right across Frankie Dettori's face after Enable's stunning Arc success may take some time to disappear, but for the bookmakers it was a grim result which one layer said could have cost the industry a seven-figure sum. Sent off the first odds-on shot in the Arc since Sea The Stars in 2009, the 4-5 winner was far too good for her rivals, powering to a two-and-a-half-length victory over Cloth Of Stars, with Ulysses third and Order Of St George fourth. The layers' misery was compounded by a clean sweep of British and Irish winners on the Arc undercard. "Enable was the result we dreaded and, although some tried to make a case against her, punters were never in doubt," said Nicola McGeady of Ladbrokes. "It's the worst Arc result we could have had." 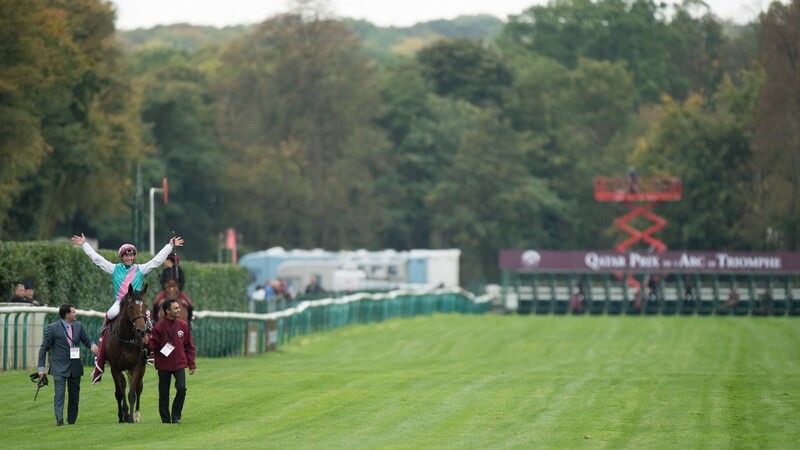 Betfair's Barry Orr was in agreement, saying: "The race revolved around Enable and punters piled into her, both in the ante-post and day-of-race market, so it was an absolute stinker of a result, made worse by the well-backed each-way Ulysses and Order Of St George making the frame as we were paying four places to each-way backers. "And, unbelievably, with no French winners on the entire card, the cross-multiple liabilities on the UK and Irish winners was substantial." Matt Hulmes of Betfred said Enable had "cleaned us out", while Paddy Power spokesman Paul Binfield added: "Zut alors! It wasn't magnifique for the books as we registered a six-figure loss on the race, but it's probably money well spent as the Flat has a new heroine who will generate tremendous publicity for our great sport." It was a similar story for Coral, whose PR director Simon Clare said: "There's no sugar-coating it, Enable was a great result for racing but a grim result for bookies. "This was a day to remember for British horseracing and a day to forget for British bookmakers, with Enable, Battaash and Aclaim all well-backed winners of Group 1 races. When you add in the heavily-backed success of Happily in the Prix Jean-Luc Lagardere, it’s fair to say the bookies lost in France today." Alan Reilly, head of racing at BoyleSports, reckoned it was his firm's "busiest Arc on record and the winner was by far our worst result", while Betway's Alan Alger claimed: "Enable's win may have just cost the betting industry a seven-figure sum."